These fun glasses for kids contain low grade "starburst" diffraction gratings. 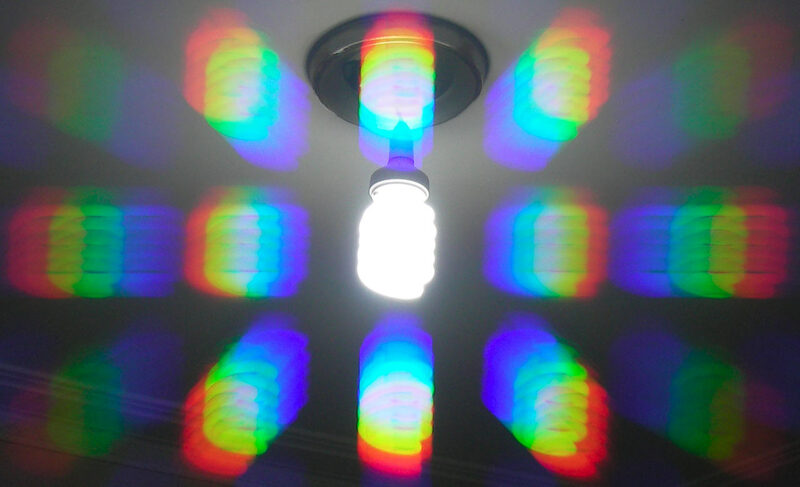 You can use them to examine the emission spectra of different light sources, which tells you about their colour rendering, which in turn helps you pick lights which give more natural output. 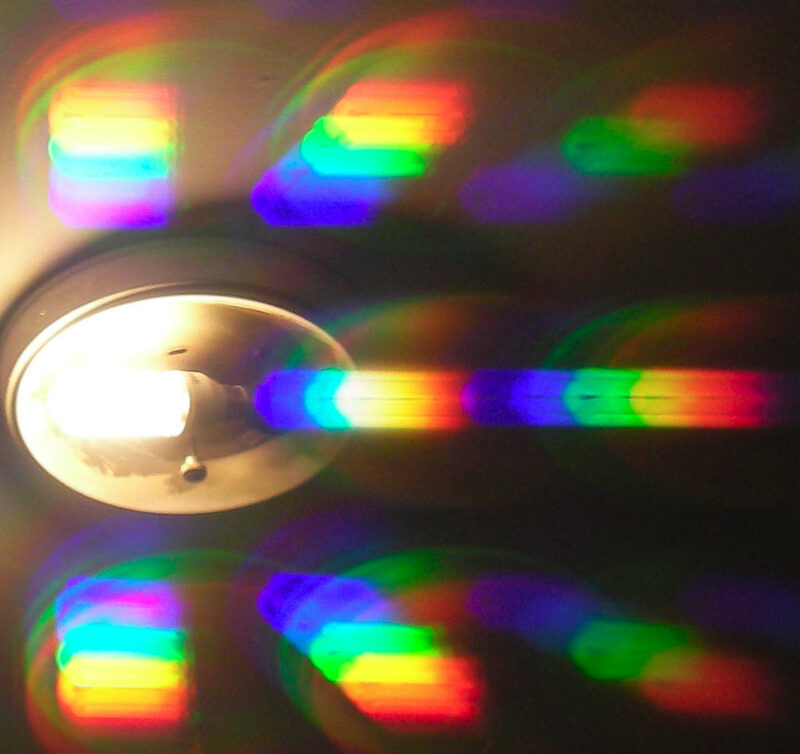 Such lights are nicer to have around your home than lights with poor colour rendering, and they can also assist you in serious colour-critical tasks such as telling your jelly beans apart. 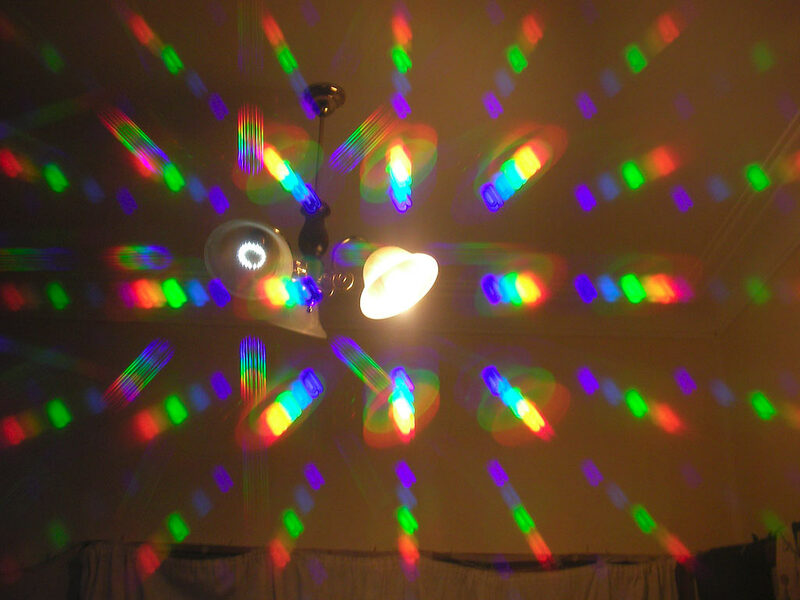 I've bought a few optically superior diffraction gratings from this eBay seller, and it's fun looking at lights through them and shining lasers through them and so on. The ones in the kiddy-specs are uncalibrated (measure the spacing yourself!) and a bit cloudier, but they're also big enough to cover both eyes, and they get the job done well enough. The light in the above picture is a normal halogen downlight, so its diffraction spectrum is a smooth rainbow, like sunlight or a candle flame. 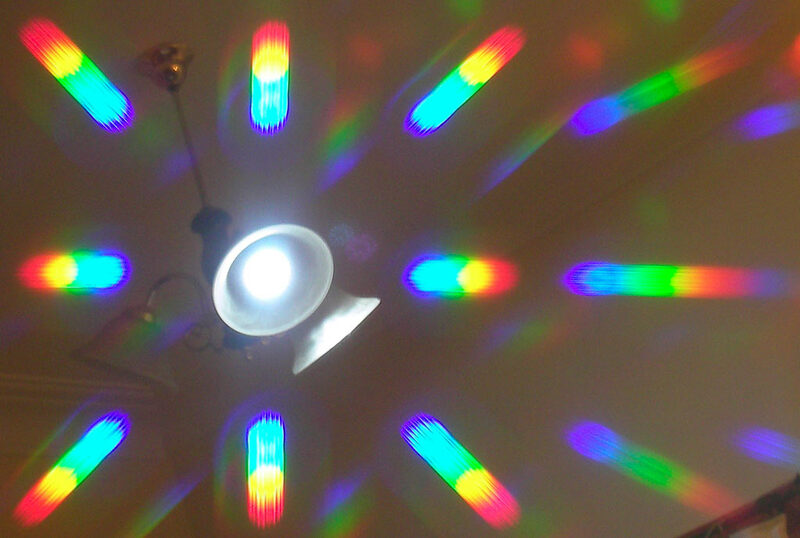 Lights with a lower colour rendering index have different spectra, and diffraction glasses make that easy to see. This is my giant compact fluorescent, which is alleged to have an eighty-plus CRI (where 100 is perfection), but which doesn't look that great to me. There's a smear of blue, probably indicating at least a bit of output colour range from the blue phosphor - perhaps a darker and a lighter blue on top of each other. But then there's quite distinct sub-images of the lamp in green and red, suggesting that it's got quite narrow output in those ranges. But it sure is bright, as low-CRI lights tend to be; the classic "triphosphor" fluorescent lamp is still popular, because it's cheap and very high efficiency. It makes everybody look like corpses, but that's just the price you pay. A normal modern "warm white" compact fluorescent lamp (CFL), flanked by a half-burned-out LED lamp of no particular distinction. 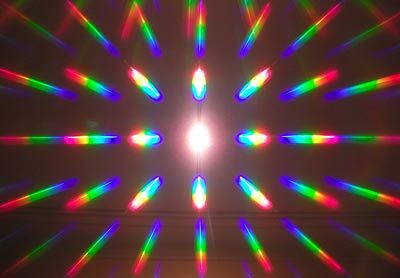 You can see quite distinct violet, blue, green, orange and red diffraction images, each of which ought to correspond to a phosphor flavour. Generally speaking, the more phosphor colours, the better the CRI. 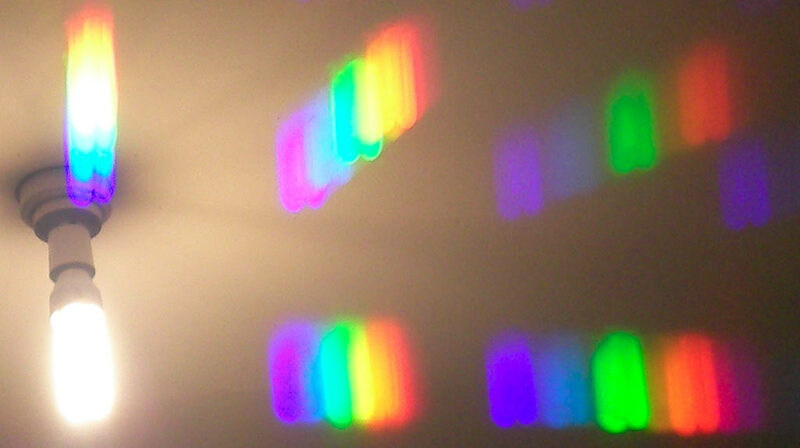 Some good images from that lamp in close-up. A different CFL. I count four bright phosphors, plus two or three dimmer ones filling out the spectrum. Yet another CFL. Maybe only four phosphor colours in this one. And, finally, another of those LED lamps, which really aren't a very interesting product - the only reason to use LED lamps for general lighting so far is if you want something that'll last 25 years, and these cheap Chinese lamps can't be counted on to last 25 days. It's a nice spectrum, though. This is a normal "cool white" shade of white LED, created by putting a mixed phosphor layer over a naturally blue LED die. The result has quite good colour rendering. I took all of these pictures with the little C6, by the way. 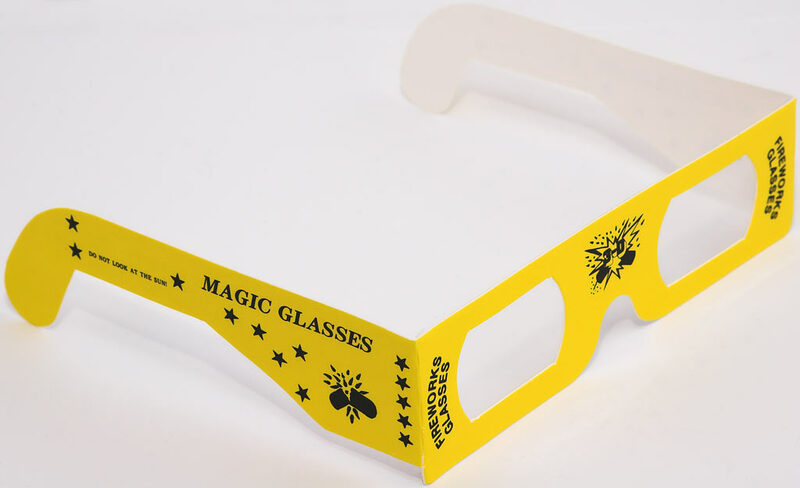 It's got a physically small lens, which makes it good for taking pictures through other things, like these glasses, or telescopes, or whatever. I had a couple pairs of these back in the 70's. But the first wife and I used them as... um... "chemical enhancement devices".